A northbound #4 train enters Fordham Road station in July 2001. Photo by David Pirmann. Yesterday afternoon the operation of the new Jerome Avenue elevated branch of the Lexington Avenue subway from 149th Street north to Kingsbridge Road was begun. The event was celebrated by the Bronx Transit League, members of which were carried over the route in a special train leaving the station at 149th Street and Mott Avenue at 2:15pm. Exercises and a concert in honor of the event followed at the Old Fordham Clubhouse, Fordham Road and Morris Avenue. .... The operation of this line will be temporary, pending the completion of the new Lexington Avenue line, of which the Jerome Avenue extension is a portion. Trains of four cars will be operated upon a ten-minute headway during the day and on a twelve-minute headway after 8pm. 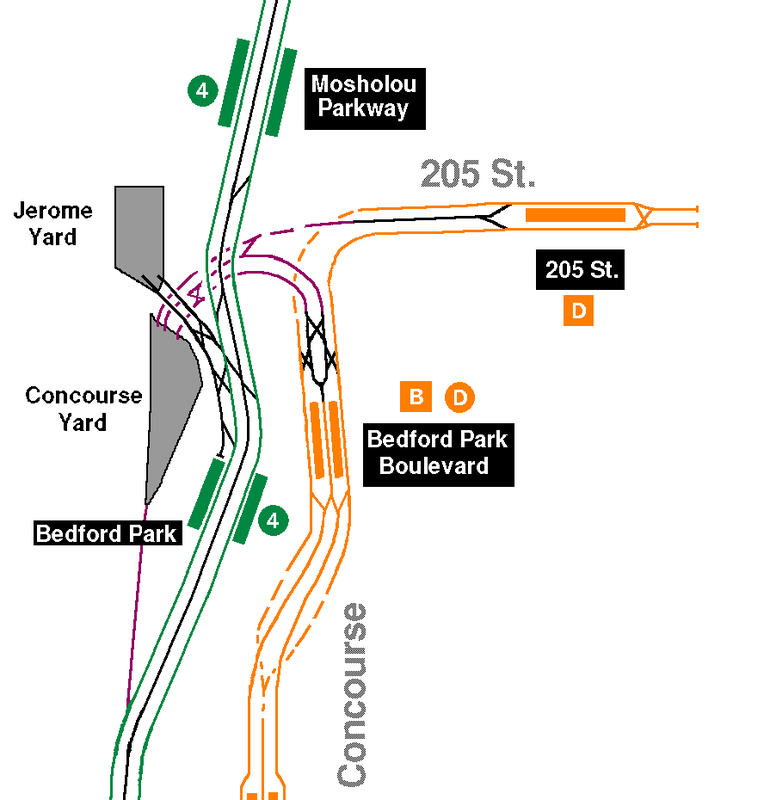 The Jerome Avenue line is one of the new elevated and subway extensions reaching into the northern part of the Bronx. It is one of the two divisions of the Lexington Avenue trunk from which it forks as a subway at about 135th Street in the Bronx. 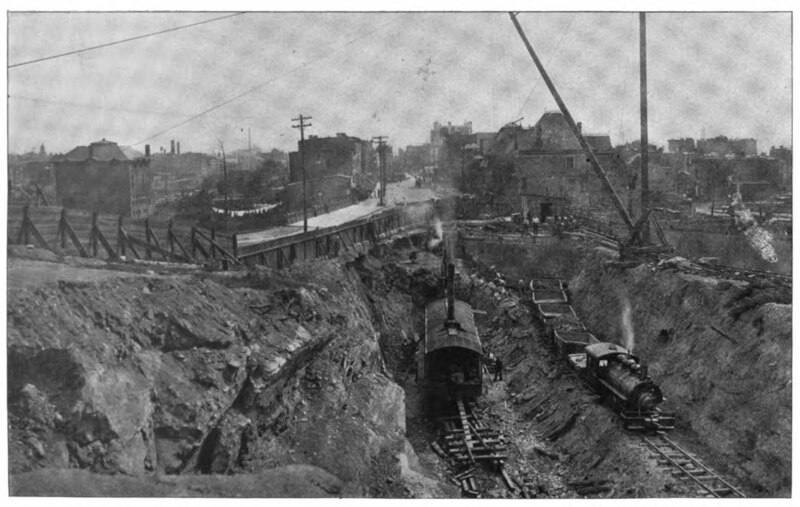 It continues as a three-tracked subway to approximately 157th Street and thence becomes an elevated line extending over River Avenue and into Jerome Avenue at 169th Street, terminating at Woodlawn Road and Van Cortlandt Park. The subway portion of the Jerome Avenue line is a little over a mile in length, while the elevated portion is approximately 4.8 miles in length. ... 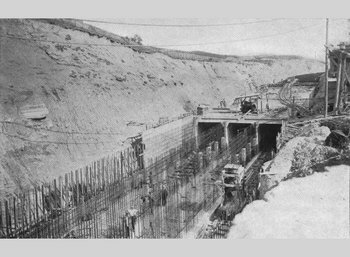 The operation of the section that was opened yesterday adds about ten track miles to the Dual System lines in operation. ... Only the stations between 149th Street and Kingsbridge Road will now be placed in service. It will not be operated throughout its entire length to Woodlawn in connection with the Lexington Avenue line until some time in the late Autumn. 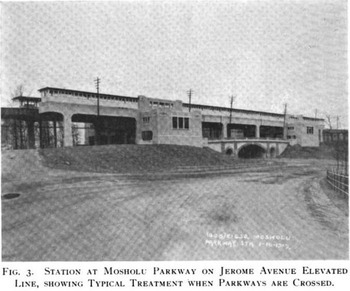 Several of the stations on this line are of steel, covered wth concrete and tile work and highly decorative in character, including the stations at Bedford Park Boulevard, Mosholu Parkway, Woodlawn, and 161st Street. At 162nd Street on the Jerome Avenue line, connection will be made by way of the 162nd Street connection with the tracks of the Ninth Avenue elevated line. Late in the Winter of 1917 it is expected that operation may be undertaken by this route. Including the subway and elevated portion from 135th Street north to Woodlawn Road the Jerome Avenue line will cost approximately, when completed, about $7,000,000. The elevated portion has cost about $3,000,000 to construct and the subway portion slightly over $4,000,000. 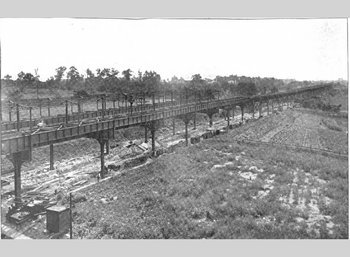 The contract for the subway portion from 135th to 157th Streets was executed on November 17, 1911, while the two contracts for general construction of the elevated portion were let on December 31, 1913, and April 3, 1914. 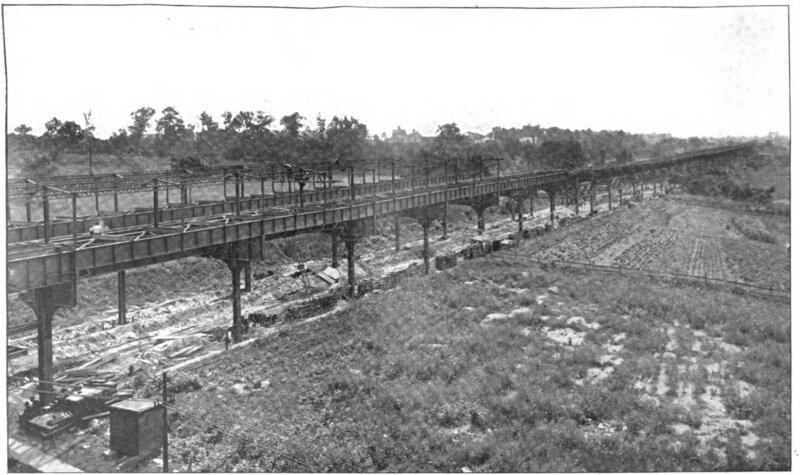 This is a three-track elevated line which connects with the west branch of Route No. 5, Section No. 15, and extends from a point near 157th street over River avenue and Jerome avenue to Woodlawn road, or Bainbridge avenue. It is known as Route No. 16, and is divided for purposes of construction into two sections known as Nos. 1 and 2. Route No. 16, Section No. 1. — This section begins at a point near 157th street and River avenue and extends in a northerly direction over River and Jerome avenues to about East 182d street. Oscar Daniels Company, contractor. Date of contract, December 31, 1913. Contract period, 18 months. Summary of contractor's bid, $1,077,978. Connection is made on this line at 162d street with an extension from the Ninth Avenue Elevated line. Route No. 16, Section No. 2. — This section begins at about 182d street and extends northerly over Jerome avenue to about 198th street; it cuts thence across the Jerome Park Reservoir property to a point near 204th street and Jerome avenue, and thence over Jerome avenue to Bainbridge avenue. Cooper & Evans Company, contractor. Date of contract, April 3, 1914. Contract period, 18 months. Summary of contractor's bid, $1,076,831. It is proposed to construct a yard for the storage of cars for this route on the property acquired by the City for reservoir purposes on the west side of Jerome avenue south of Mosholu parkway known as Jerome Park Reservoir property. The stations at 200th street, Mosholu parkway and Bainbridge avenue received special architectural treatment. Jerome Avenue Branch. Showing progress in Franz Sigel Park. 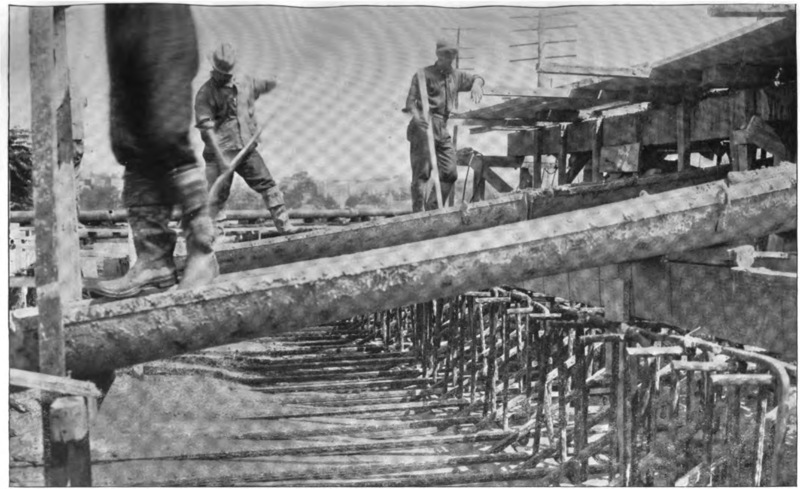 PSC report 1912. Jerome Avenue Branch. 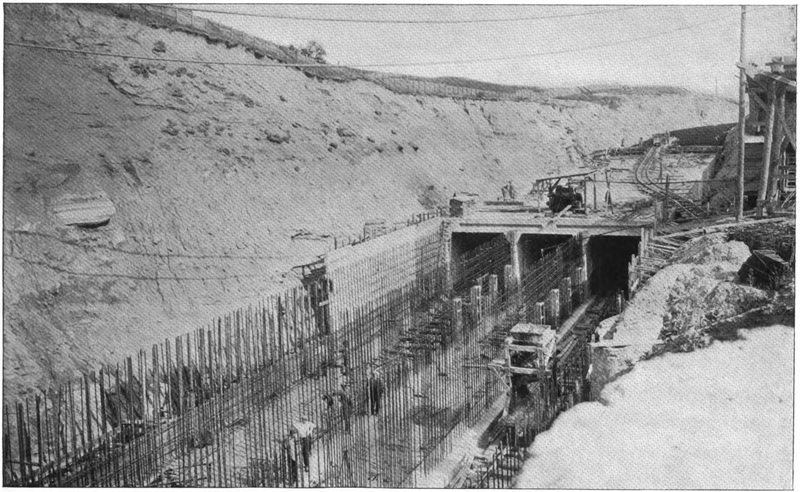 Subway under Franz Sigel Park, showing construction of reinforced concrete roof and curtain wall. PSC report 1913. Jerome Avenue Branch. 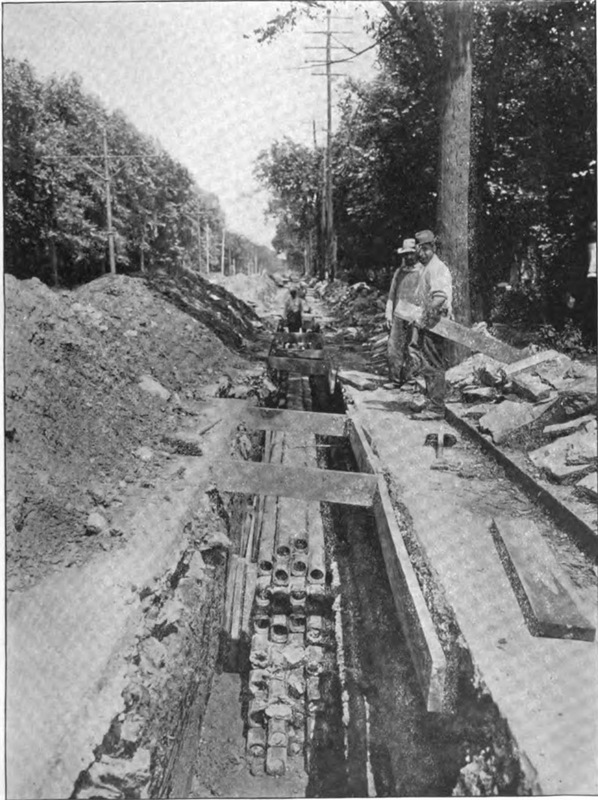 Subway under Franz Sigel Park, between Walton and Gerard Avenues, showing reinforcement for side and center walls, and completed subway. PSC report 1913. Jerome Avenue Branch. 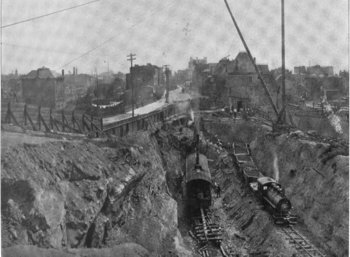 Construction of railroad duct bank along east side of Jerome Ave. 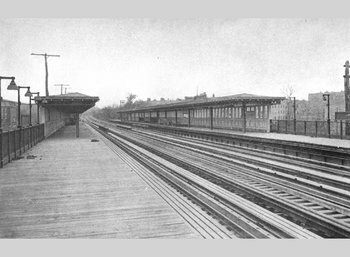 Looking north at 174th St. PSC report 1914. Jerome Avenue Branch. Elevated Structure in Process of Construction on River Avenue South of 167th Street. PSC report 1915. Jerome Avenue Branch. Finish of Typical Station (176th Street). PSC report 1917. Three tracks, two side platforms. There is an available crossover from one side platform to the other. There are mosaics indicating "Uptown Trains" and "Downtown Trains" (with arrows) in the mezzanine. The original name was Mott Haven as indicated by the MH mosaic border. Three tracks and two island platforms. The center track is used for service in the peak direction. A free transfer is available here for the #2 and #5 lines of the original IRT Bronx route, which stop at the lower level of this station. A careful look at the walls will reveal a sign to the "New York Central Lines" which were never built here. Three tracks and two side platforms. There are extra exit stairs to handle stadium crowds at each platform. Two mosaics indicating "161st Street" are painted over at the main exit stairs on each platform. Windscreens have been installed with the side effect of preventing a good view of Yankee Stadium from the station. The station complex was renovated in 2005 which included building elevators to serve the IRT and IND lines below. Looking northward from the platforms, the tracks swing apart to allow the old 9th Ave. El tracks to join our line. A stub of the lower level 9th Ave. El trackage still exists. Three tracks and two side platforms. Renovated in 2005. Three tracks and two island platforms. This is the only "express" stop on the elevated line. There are extra side exits from the wooden mezzanine near the stairs to the platform. This station is between 3 and 4 stories off the street. Three tracks, two side platforms. Renovated in 2005. 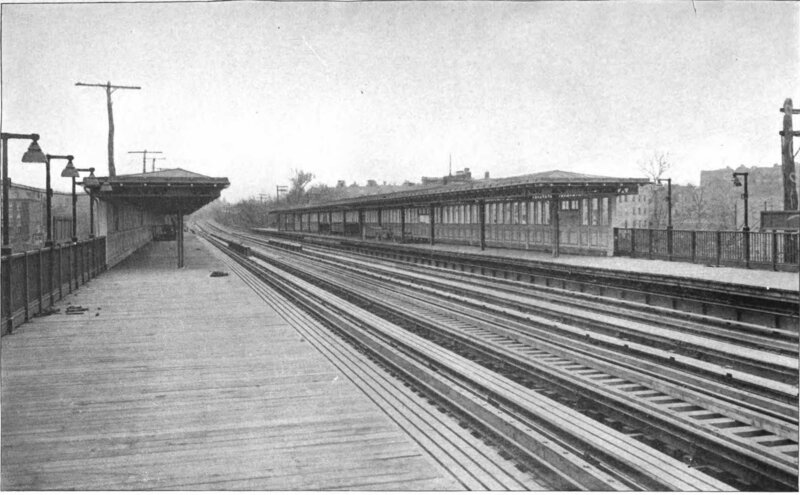 IRT Woodlawn Line at Bedford Park Boulevard. R-142A train on #4 service. Photo by: John Dooley, October 2010. Three tracks and two side platforms. Due to street layout, the station building is at ground level with the tracks above the building. The Concourse Yard complex is located on the west of the station with track connections at the north end. The station has a brick mezzanine and stairway walls with "BPB" and restroom mosaics in the station house. A storeroom is located on the landing of the stairs to the platforms. A pleasant walk to the east connects us to Metro-North and the New York Botanic Garden, and to the west one can walk around the yard complex. The Concourse Yard serves as one of the few interconnections between the IRT and the BMT/IND divisions. Three tracks and two side platforms. Renovated in 2005. The center express track, which is not in revenue service, starts just north of this station. 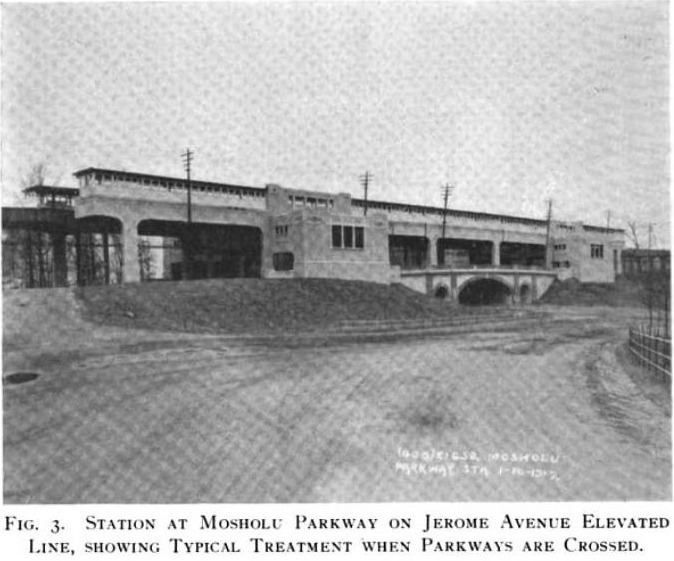 Station at Mosholu Parkway on Jerome Avenue Elevated Line, Showing Typical Treatment When Parkways Are Crossed. Two tracks, one island platform in use; two side platforms disused. Terminal station. 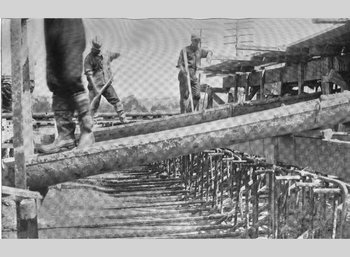 The slide platforms were probably once used to unload and the center platform to load such as was designed at 59th St./Columbus Circle and the other Bronx IRT terminals. The mezzanine is brick. Renovated in 2005. "Three New Links Of The Dual Subway System Opened", The New York Times, June 3, 1917. By Peggy Darlington and David Pirmann.